Everyone knows that Vegas is allways changing and allways reinventing itself every year there is somthing new and better, it’s a solid bet that when in Vegas you will allways see men in construction hats and mechanical diggers and hear the noise of building somwhere on The Strip. 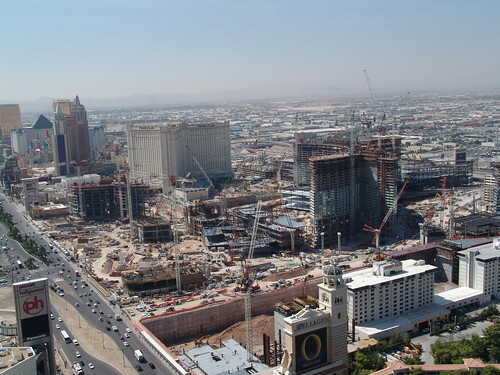 Below is a report from a guy who arrived back from Vegas at the end of last weekand gave the following report on the current building activity on The Las Vegas Strip. Luxor – big changes happening inside, losing the egyptian theme, half of the casino area done already, reception area still the same. New York, New York – part of the casino area closed off (the stage part), due to be finished late this year. Planet Holywood – Casino area finished now (looks very impressive), pool area and shops still in the old Aladdin style. CITY CENTRE – WOW – major bguilding site!!! I last went to Vegas 10 months ago, and cannot believe how far they have got with it all. Monte Carlo – I feel sorry for those staying the this hotel if you want to spend time by the pool. This is currently open to non-residents and I can see why, it is surrounded by building work so close from the CITY CENTRE project, really noisy!! Caesars Palace – New tower being built, but causes no disruption as building work is off the strip really. Mirage – Volcano closed (due to re-open late this year), Moving walkway closed. All rooms being renovated – there is a disply of the rooms in the reception area (looks really good). TI (Treasure Island) – stayed there and all rooms being renovated (these are really nice). Palazzo – casino/rooms and shops all finished – very impressive looking. There is building work across from the TI where it looks as though they are building some sort of shopping mall! !